After announcing some of the world’s first AMD-powered Chromebooks at CES 2019 this month, Acer has announced two new 12-inch Chromebooks at the Bett conference for educators. 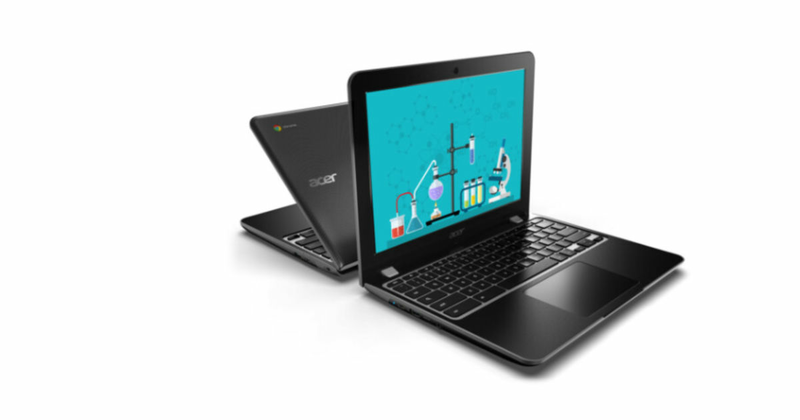 The pocket-friendly notebooks are named Acer Chromebook 512 and Chromebook Spin 512 and will mostly appeal to students. The Chromebook 512 is priced $329.99 (about Rs 23,500) and the Chromebook Spin with some additional features will retail for $449.99 (approximately Rs 32,000) when both go on sale in April. Speaking about the features and specs, the Chromebook 512 has a 12-inch IPS display with 1,366 x 912 resolution and 3:2 aspect ratio. Buyers will be able to select between touch or non-touch options. The new Chromebook has a 180-degree hinge which allows the screen to lay flat on the surface. In terms of processing power, Acer provides three options with the Chromebook 512 – dual-core Intel Celeron N4000, quad-core Celeron N4100, and quad-core Pentium Silver N5000 processors. Buyers will be able to choose configurations with 4GB or 8GB of RAM and 32GB or 64GB of storage. The Chromebook 512 is also MIL-STD-810G standard compliant, meaning it is fairly rugged and can handle certain amount of physical abuse. Also, the keyboard is spill resistant. In terms of connectivity, the laptop gets two USB Type-C ports, full-size USB 3.0 ports, a microSD card slot, and a headphone jack. The Chromebook Spin 512 is the more premium offering with some improved features over the above mentioned ones. Instead of a 180-degree hinge, it has a full 360-degree hinge, thus the Spin moniker. There’s a bundled Wacom EMR stylus that can be used to jot down notes on the 3.31-pound laptop. Besides that, the screen, RAM and storage, port selections are the same as the Chromebook 512. However, CPU options exclude the dual-core Intel Celeron N4000, which is limited to the more pocket friendly option.